I had an idea for fiddling around with the Bento Tee pattern by Liesl & Co the moment it was released. While I searched and searched online for the exact fabric I wanted, I sewed a test version exactly by the pattern to see how it worked straight up. I can never go past the remnant packages at The Fabric Store. Maybe it's the way they present them, rolled around a cardboard sheet with a nice brown paper cuff. It might be the designer names that are sometimes scrawled in texta on that brown paper sleeve, or maybe it's just the price. Whatever it is, I buy them for the kids, but then start coveting them for me. This was one such fabric. 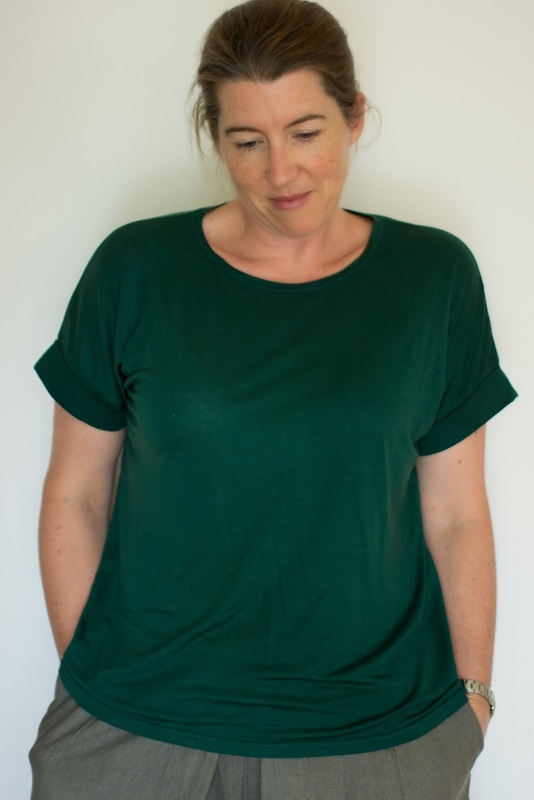 It was labelled Lyocell knit and it is insanely pleasant to sew with and to wear. It feels like a slinky, slippery, silky knit but with a bit of ironing it held the sharpest creases and sewed as easily as a fine woven cotton. I have never seen fabric advertised as lyocell knit before, but trust me, if you do, then buy a bit. Apart from being so nice to work with I can vouch for it being brilliant to wear in a heat wave too! The pattern is such a fun, easy sew as well. The front and back are basically symmetrical (with the excection of the neckline) and the sleeve is a dropped shoulder sleeve so attaches without any fuss. I sewed the whole thing on the overlocker and then just finished the bottom hem with a double needle. Everyone talks about T-shirts being quick to sew, but this one really is. I did spend a few minutes hand sewing my sleeve cuffs up as they were unlikely to stay put without some attaching. I really did try to photograph this "in the wild" but was wearing it with tight jeans, on a blustery windy day and once I saw the pictures I realised how bad it looked. The wind didn't help as I looked about 8 months pregnant in most shots. Mental note: Cropped boxy tops do not go well with fitted bottoms for me. I'm blaming the weather and poor pants choice as I quite like how it looks here. I had grabbed another knit remnant on a later trip to The Fabric Store and couldn't work out what else to do with it, so a second Bento tee came to be. This was a decidedly tricky piece of fabric. Because of the lovely packaging I hadn't realised that what I thought was a grey-beige snakeskin looking knit actually had a very pronounced ombre effect. Only the shading of the ombre went across the grain from selvedge to selvedge. That meant anything I made with the stretch horizontal would also have the shading going from side to side instead of the more usual top to bottom. I'd resolved to make leggings for A, with one leg considerably darker than the other (could be cute, no? ), when I changed my mind and thought of another Bento tee but with a kind of harlequin effect. So I cut the sleeve cuffs and neckband to shade in the opposite direction to the shirt. One side seam is barely noticeable, but with a full pirouette the other side is dramatically different. It's odd, but I kind of like it. My comments keep freezing mid writing! But I'll try this again. What nice, wearable tops! And I hope the perfect fabric appears and leads to the perfect summer top! I came sufficiently close with the fabric I found in the end, thanks! CUTE!! I like this style on you! 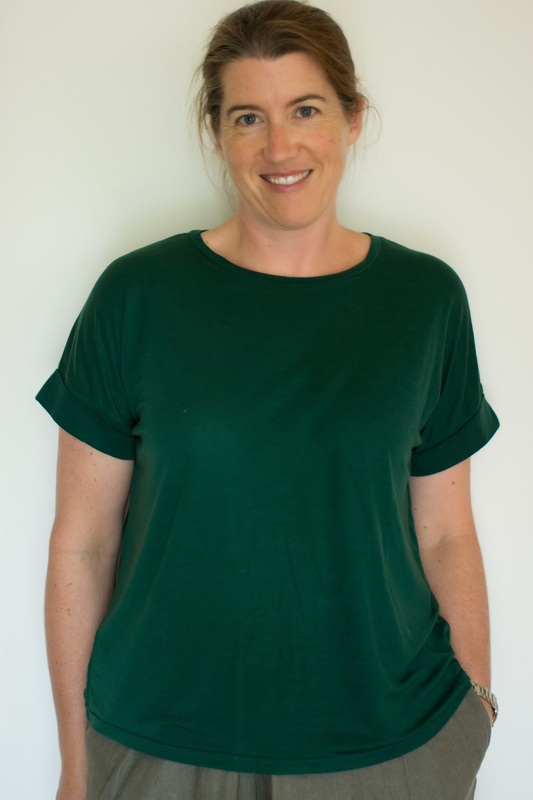 I've been a little on the fence about the Bento tee, mostly because of the higher neckline, and bc the Plantain is currently my TNT, but I do really love those sleeve cuffs and it's a flattering shape on you! I couldn't do this shape with tight pants, either, but it looks perfect for a higher waisted skirt or pants. Thanks Inder. Did you see Kristin's? She scooped the neckline out a bit (and I did a bit too much with my altered one). the sleeve cuffs are really nice aren't they. cute tops! and oooooh the mystery of the project stuck in your brain...good luck with the fabric hunt! Great tops and they sound perfect for summer. Thanks Sharon. It's a very easy wearing pattern. In fact with some wide legged pants I could almost feel like I was wearing pyjamas! that kind of comfy. 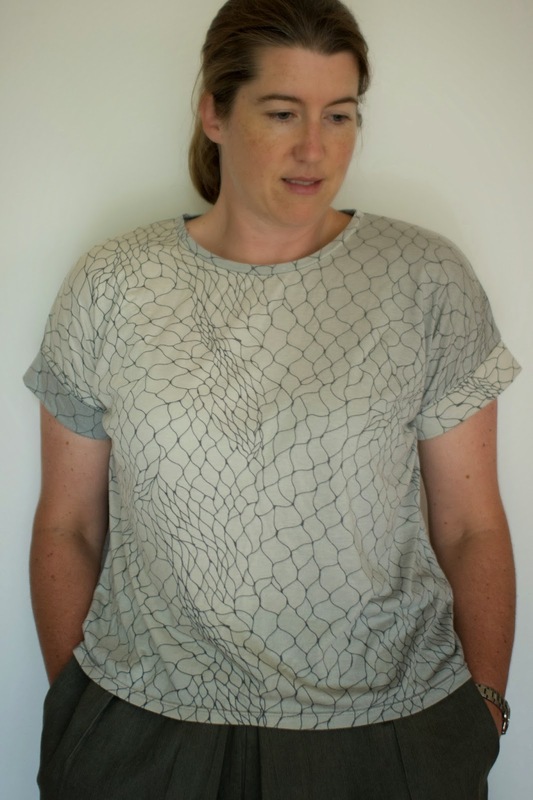 I find with the Liesl+Co patterns, the drapier the fabric the better the look. I do love that green on you. That's definitely been true for the ones I've made. Perhaps that's the kind of fabric that also makes up for my lack of fitting ability though too. A nice, sharp, fitted Bistro dress is on my bucket list! Thanks, I love that green too. I love that shade of green on you! The tops look great, Shelley! THanks Cindy, it is such a lovely colour. oh! this top is perfect on you, I love both versions, I think it really is a great cut for you! :) that print on the second one is gorgeous.